Our Passion is Adventure and Sharing it with You! Our guides return to Alaska every summer to work in the pristine wilderness and to help others be able to experience this remote beauty. Technical know-how, wilderness medical training, and passion are just a few of the things we require from every guide. We recognize that the guide can make the difference between a trip being “average fun” and an “experience of a lifetime. ” As such, we invest heavily in our guides to make sure they are capable of leading more than just a safe and enjoyable trip. 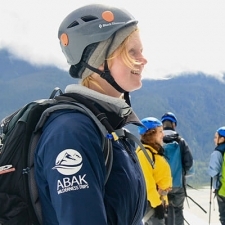 The majority of our staff were born and raised in Alaska and have gained invaluable personal experience hiking, paddling, and climbing in our backyard; the Tongass National Forest, the Inside Passage, and the Juneau Icefield. This personal knowledge combined with years of training and safety expertise leads to the best adventure possible, from ocean to ice! Prior to being hired with Above and Beyond Alaska, a lead guide must have at minimum a Wilderness First Responders certification to assess and manage medical issues in the backcountry and often they hold an EMT license. They also have personal experience trekking on glaciers and sea kayaking, an ability to assess risk and manage clients, and an upbeat, positive attitude with a passion for the outdoors. At the beginning of the season all of our guides participate in our extensive in-house training. Each year our training covers: risk assessment and management, wilderness first aid, emergency response procedures, Leave No Trace ethics, the natural history for each trip areas, and glacier travel, ice climbing, and kayaking and canoeing technical skills including rescue techniques. You can rest assured that you are in expert hands for your adventure. Safety is our #1 priority and our guides have the training and experience to anticipate dangers and mitigate or avoid them. While every outdoor activity carries with it some level of risk and we can’t guarantee you won’t get hurt, we have an impeccable safety record. We also invest in the best and newest safety gear every year, require our staff to all hold CPR certification, and extensive protocols for fast evacuations if anything was to happen. You have a whole team working together to ensure your safety and the highest quality experience. No experience is required for any of our guided trips! We will show and teach you a new skill! Don’t know how to ice climb up a vertical face? No problem, we’ll set up a safe system, demonstrate the correct technique, and coach you through it. You’ve never been in a kayak? No problem, we’ll show you how to efficiently paddle forward, backward, turn, and stop. Never been camping? No problem, we’ll provide the gear, help setup your tent, tell you how to stay warm and dry, and cook delicious meals on a backcountry stove. This is a perfect opportunity to not only experience the best in the Alaskan wilderness but have an adventure trying something new! By sharing their personal stories and knowledge of the natural and cultural history of the area our guides will help create a sense of place and enhance your appreciation and enjoyment of the unique environment you will be traveling through. Let us show you the rich and diverse ecosystem of Southeast Alaska that is interconnected from the towering peaks of the icefields to the ocean waterways of the Inside Passage. Have a particular subject you want to learn more about? Just ask! Want to be the leader hiking into the rainforeset? Trekking onto glaciers? And exploring the Inside Passage by kayak? Shoot us an email today to find out more or if you a ready to apply, please complete the application by clicking the button below. Please note: you must have a current WFR or EMT certification to be considered for a guiding position but we love welcoming other team members who want to learn and experience the best industry in the world.